YingLi provides high quality, cost competitive photovoltaic (PV) modules which are manufactured in China using industry standard components and material accordance with IEC 61215 and come with 25 years limited warranty. 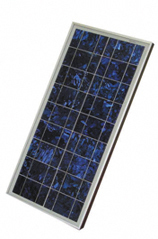 Main product range includes both monocrystalline and polycrystalline solar PV modules which range from 5W to 180W. Cells are laminated between high transmissivity, low iron, 3mm tempered glass and come in a heavy duty anodised aluminium frame which provides high wind resistance and convenient mounting access. Modules are manufactured in accordance with IEC 61215, and come with 25 years limited output guarantee.